3. How Does Vibrational Excitation Affect the X-ray Absorption Spectra of Monohydrated Halide and Alkali Metal Clusters? 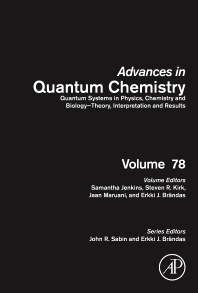 Quantum Systems in Physics, Chemistry and Biology, Theory, Interpretation, and Results, Volume 78, the latest release in the Advances in Quantum Chemistry series presents surveys of current topics in this rapidly developing field that has emerged at the cross section of the historically established areas of mathematics, physics, chemistry and biology. It features detailed reviews written by leading international researchers.